Our dinner meeting on 14 November 2017 featured two speakers. 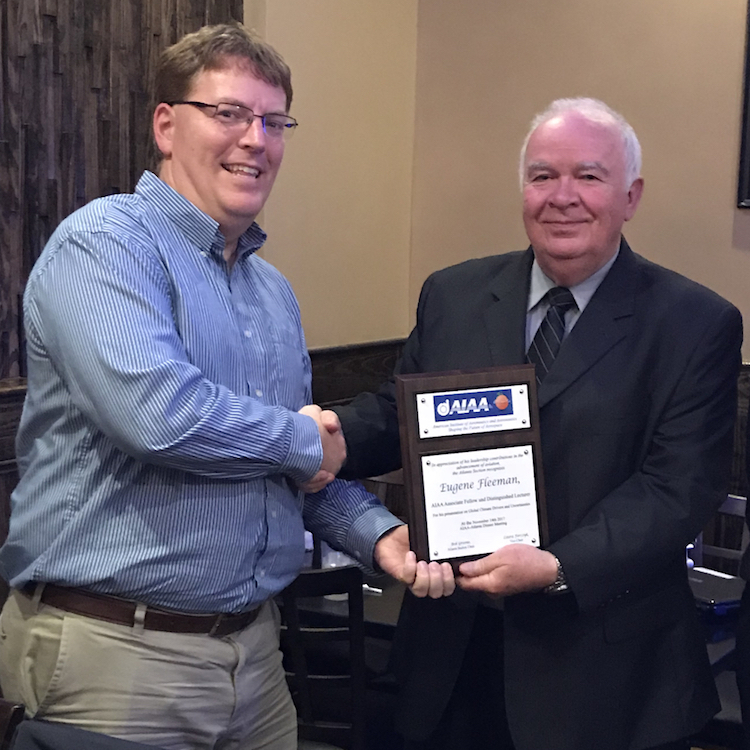 AIAA-Atlanta Secretary Neil Sutherland presents a plaque to AIAA Distinguished Lecturer Gene Fleeman. Our first speaker was AIAA Associate Fellow and AIAA Distinguished Lecturer Eugene L. Fleeman. Mr. Fleeman is best-known for his textbooks and expertise on missile design. His presentation on Global Climate Drivers was based on his keen emphasis on physics and data. Sorting out natural climate and weather variation from that caused by humans is a signal in the noise problem. Mr. Fleeman’s overview of factors driving both warming and cooling provided a thorough oversight to this complex system. 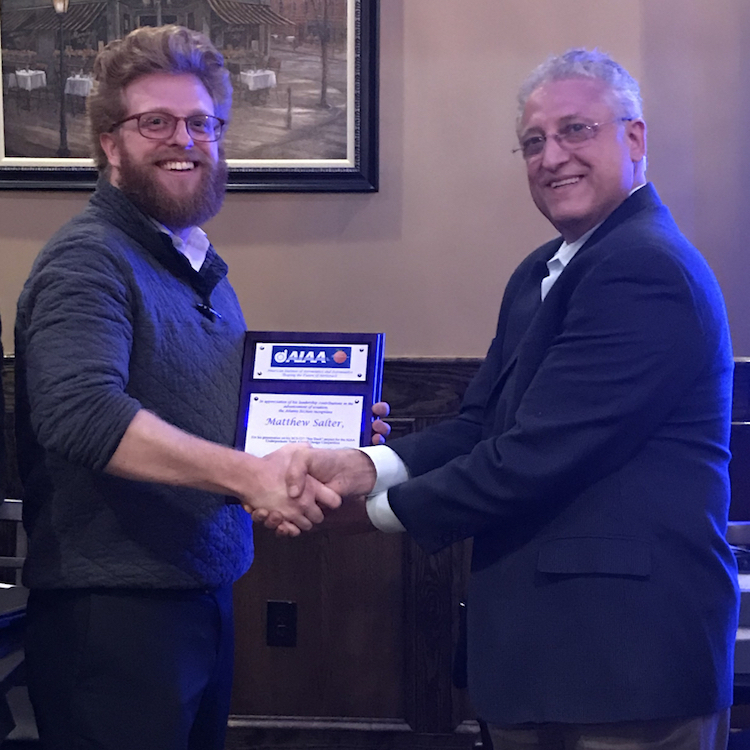 AIAA-Atlanta member-at-large and recent Kennesaw State graduate Matthew Salter receives a plaque from AIAA-Atlanta member-at-large Alan Varagona. Our second speaker of the night was recent Kennesaw State graduate Matthew Salter. Matthew, Austin Collet, and Shawn Sinclair placed second in last spring’s AIAA design competition. Their entry was the SCS-527 “Sea Duck.” The challenge was to design an aircraft capable of short take-off and landing on both water and rough runways. The aircraft needed to be able to carry our three separate missions — passenger service, cargo service, and navy surveillance. Matthew’s talk included a wide range of tables and calculations as he discussed the design process. Austin and Shawn also attended, showing off the model aircraft. 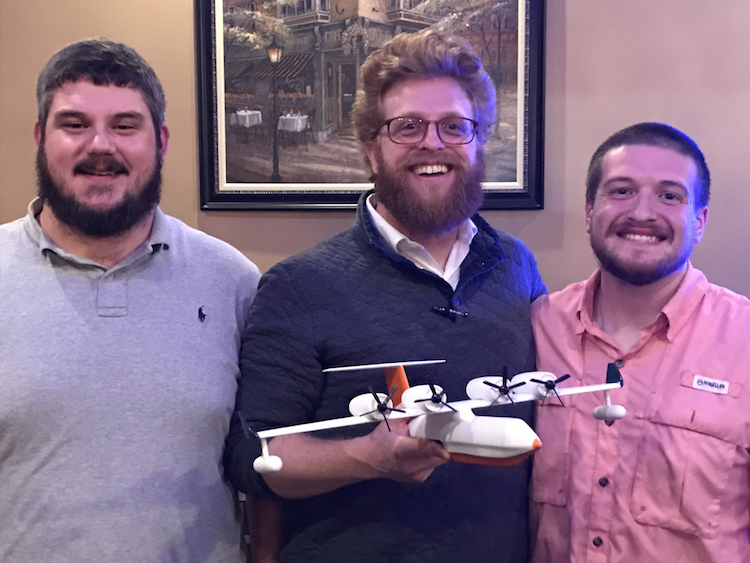 Shawn Sinclair, Matthew Salter, & Austin Collet pose with their award-winning SCS-527 “Sea Duck” design. AIAA-Atlanta does not have any activities planned during the holiday season. Please check back for information on our next activities in January 2018. In the meantime, have a heartfelt and joyous holiday season!